Frigg, or Frigga, is the queen of Asgard. In her hall, Fensalir (meaning "Water Halls" or "Marsh Hall"), she spins, all the while knowing the fates of all things, yet never unveiling her vast knowledge. 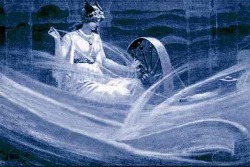 While her husband, Odin, journeys through the worlds in search of knowledge and wisdom, Frigg rules the realm of the Gods and sits in Odin's high seat from which all of the nine realms may be seen. Connected with the Norns through her spinning and natural ability as a seer, it is one of her most striking characteristics that she keeps her own counsel. In Norse traditions the constellation of Orion is called "Friggjar Rockr," which means "Frigg's Distaff." Among her many handmaidens are Gefion ( "Giver," who claims unwed women upon their deaths), Saga (with whom Odin sits at night sharing tales), Syn (guardian of doorways), Gna ( "Journey," the messenger), Fulla ("Fullness," keeper of Frigg's jewels and patron of wealth), Snotra (who can inspire proper behavior in even the most boorish of men), Eir ( "Mercy," patron of healing), and Hlin ("Pity," she helps lovers overcome obstacles to their marriage). Frigg's symbols are the distaff and keys. For her is named the day "Friday." Frigg first spoke to GOSH during the omen taking at Yule 2004. By Midsummer 2005 it was clear that she had much to teach us and we proclaimed her our new Matron. Lugh is the god of Light in Gaul and Ireland. The grandson of Balor and of Diancect, born of Eithne and Cian, and fostered by Manannan and Tailtiu. He is the guardian of the spear of Gorias which kills all opponents. When the Tuatha de Danaan were oppressed by the Fomorians, he came to their aid. He was refused entrance to the hall of their king, Nuada, but eventually was allowed in because he combined many skills in one person, for which he was called Samildanach (Many-Skills). Nuada, the king of the Tuatha de relinquished his throne to Lugh for 13 days due to Lugh's demonstrated talents, wit, and skills. In the battle with the Fomorii, Lugh killed his grandfather Balor, a Fomorii leader, by piercing him through his baleful eye. He was the spiritual father of CuChulain, and fought in his son's place to give him rest during his lone combat at the ford during the Cattle Raid of Culaign. In the Welsh Mabinogion he is Llew, the son of Ariahnrod. His mother curses him to have no name but is tricked into naming him by Gwyddion. Angered, she curses him to have no weapons unless she arms him herself. Again Gwyddion tricks her. She then curses him to have no wife of the race of man. Gwyddion and Math create a woman from flower blooms to be Llew's bride. She later betrays him and her consort wounds Llew with a spear. 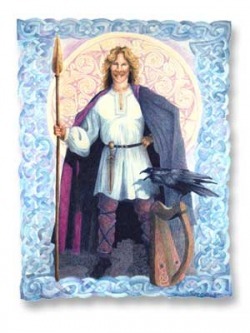 Lugh is analogous to the warrior Llwch Llawwynawc who helped Arthur obtain the cauldron from Annwn. His mythos passed partially into that of Lancelot. His many epithets describe him as being skillful with weapons and crafts.